Most moms will have different reasons for joining an infant swim class. Some do it so they get out of the house, to meet other mommies, to burn off some of that boundless baby energy or as I did in my case, to get my little one used to being in the water. Swimming classes held at the local Whitby Recreation Complex are led by a trained swim instructor who will guide you and a group of other parents through water play activities. This includes, holding your baby on the side of the pool and having them “jump” into the water, helping your baby to float on their back with the help of pool toys, practice using life jackets (for baby and parent) and if you’re brave – dipping your little one under the water! The view of the baby pool at the Whitby Recreation Complex and some of the toys used in the “Starfish” infant swimming class. What I love about this activity is that there are a ton of scheduling options offered through the Whitby Recreation Complex. Starfish Infant swim classes are held on both weekdays and weekends, so if you decide to try an activity like this you can be flexible in who you bring along, whether it be a family member, mommy friend or your partner. Registration is open now for these group swimming lessons for January-March, 2015. Starfish swimming classes are open to babies 4-18 months old. You can register in person at the Whitby Recreation Complex, or online. 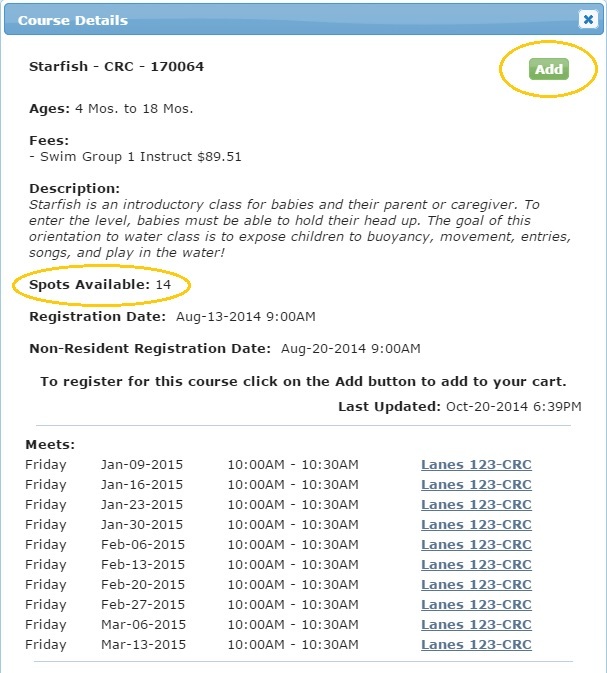 Cost: The Starfish Group Swimming Class program runs for 10 weeks and costs $89.51 (approximately $9 per class). 1. Check out the Fall/Winter Activity Guide and pick your preferred class times and days. Note the corresponding class codes as you’ll need these for later in the process. 2. Call the Recreation Program staff (905-666-1991) and ask for a PIN and barcode, which becomes your username and password for the online registration system. Keep these details saved somewhere that you can find them again. This is important because you will continue to use these login details when signing up for swimming classes in the future! This is a one-off type of step in the process but it’s worth it. 3. Once you have this information, sign into the online registration portal and search for the class code you noted earlier. Once you have searched for the class, a screen like this will appear showing you how many spots are still available. If there is space available, a green button will appear at the top of this box that says “Add” which allows you to add this class to your account. 5. Find the Checkout button and finalize your payment for the program.